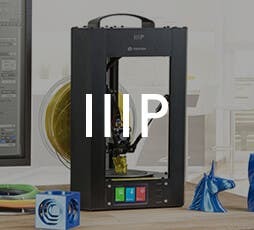 Would this be good for a first tablet? BEST ANSWER: YES! I gave my daughter this for Christmas. This morning she loaded the drivers, hooked it up and was drawing wishing a few minutes. She is an incredibly talented artist. She is not a tech geek but does know her way around the computer (Mac) very well. It's easy to set up and use. 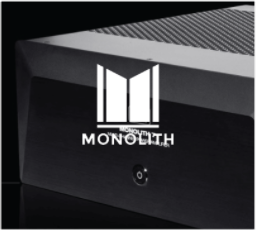 And it's from Monoprice so if there are any issues (unlikely) they will take care of you! Yes, definitely. The reason I took this one was for some basic teaching Math for some students remotely. Its not a monochrome tablet, works fine on the Win10 & Win7 also. So far so good. I heard it has drivers for Mac & Ubuntu too, did not try it yet. Tried some drawings also. It is not a tablet. It is a pointing device. My 12 year old figured out how to use it in 15 minutes. She loves drawing with it. It's a cool gift for a growling young mind venturing into computer art. It is pretty straight forward and easy to understand. A good first tablet. my computer doesn't have a CD Rom, will i still be able to use this tablet? Have had this tablet a bit over a year and it suddenly wont work. I have completely reset my entire computer and reinstalled the driver multiple times. The tablet reacts with the blue light when the pen is near but wont move the curser. It will click and respond but I can NOT move using the pen at all. Yes I have changed batteries as well as pen tips. This is very upsetting and I wish there was a solution please help!!!! Is there a solution to this problem? BEST ANSWER: Hello, thank you for your question and I am truly sorry for the inconvenience you've encountered with the item. Have you tried this on a different USB port on the computer? (specifically the ones in the back, on the motherboard?) Otherwise I would also try removing any additional mouse drivers that you have or any other USB device for testing purposes and see if it'll work. I hope this helps, thank you! I have owned this product for a few years now and have recently moved from a PC to a MacBook Pro w/ Touch Bar. Were can I find the Mac Drivers for this product? Hello, I'm using the pad with a mac, how do i configure the pad to the mac? I lost the pen, can I purchase another separately that will work with my tablet? My pen has stopped working. I have replaced the battery (With a new, working battery) and it still doesn't work. Is there any way to get a new pen? Or is my tablet now unusable? BEST ANSWER: I had a similar problem. I ended up going into the control panel and resetting the software. Then reboot your computer. I've recently lost the default stylus that comes with my tablet. Could you recommend a replacement? BEST ANSWER: Our sincere apologies for the any inconvenience. Unfortunately, we do not carry replacement pens. Different pens may be supported but some pens may be configured differently and may encounter issues. I would recommend trying to search an online forum to see if other users may have located a pen that has successfully worked with the tablet. I hope this helps. Okay I Recently had a virus on my computer which made me lose all my storage. I lost my CD that came with it but I found the driver online. I use this tablet mostly for art but when I draw and take a stop on my pen, then draw again connecting the lines, it spaces and turns all weird. I really need help and will provide a video if asked so you will understand more better! So please can u help me? If the pen breaks will any other tablet pen work? 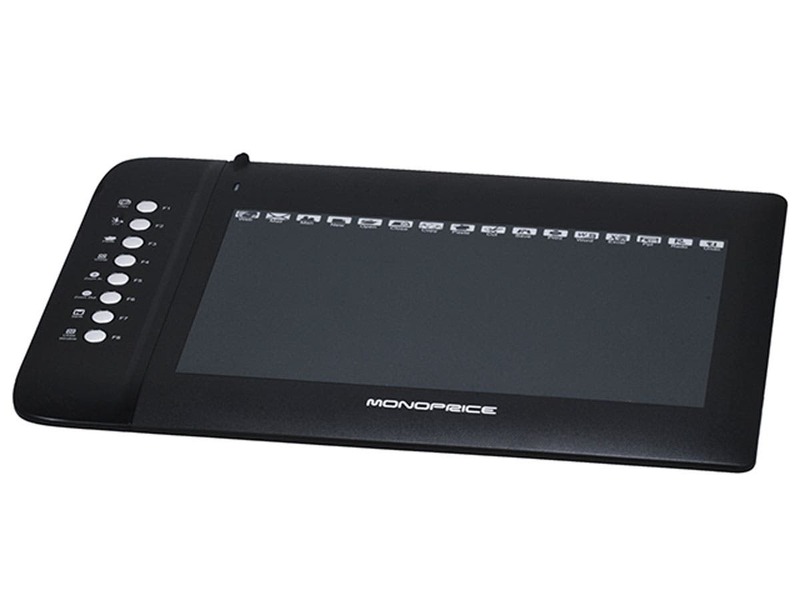 BEST ANSWER: I have a Wacom tablet as well, and the Wacom pen doesn't work with the Monoprice tablet. My tablet will do this weird thing that when I try to draw a straight line it will zigzag, any ways to fix it or do I have to buy a new one? BEST ANSWER: i found some called ugee replacement nibs for drawing tablet pen. It comes in 10 . I can’t list what site, but they look identical, and I plan on getting some. 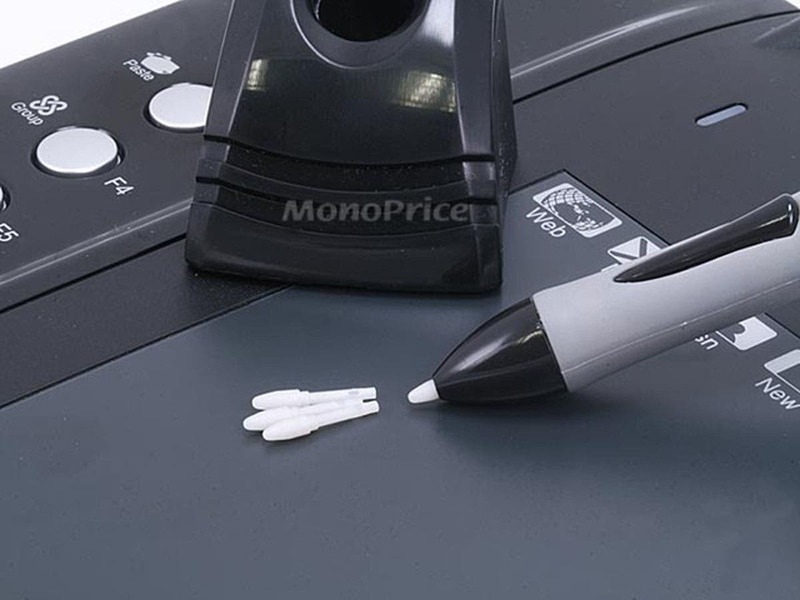 I have one of these tablets, and have lost the replacement nibs for the pen, I searched for more online, but couldn't seem to find any, is there a site I could go to, to get more? 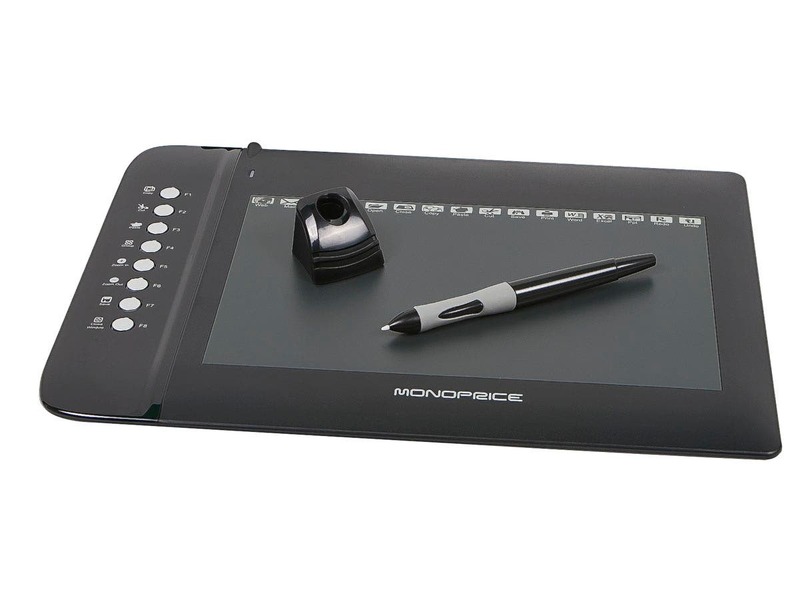 If I have a Monoprice tablet, will other tablet nibs work for my pen? Like a Wacom nib? Where can I find a replacement pen? I lost mine and don't want to have to buy a whole new tablet, please help! 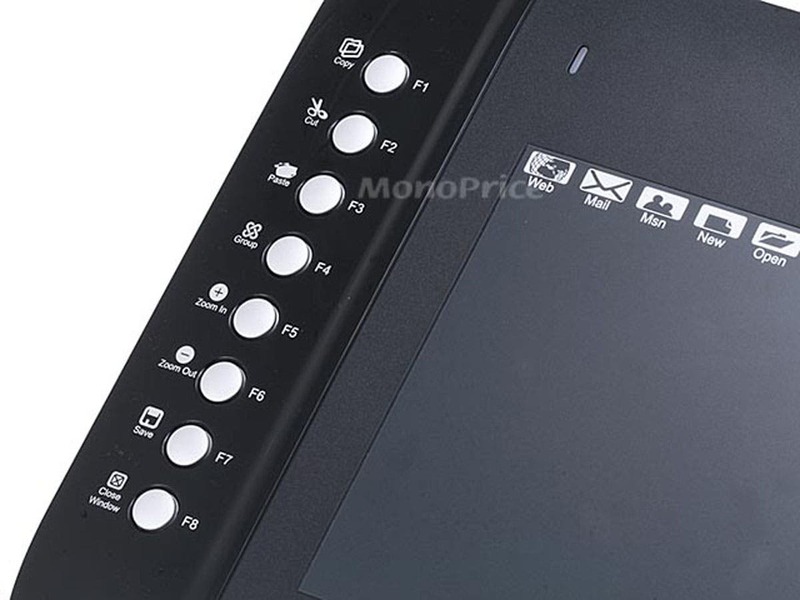 I have this tablet since 2015, and works pretty well, but with the last upgrade of Windows 10, the drivers suddenly stop working with my drawing program, which is Paint Tool SAI, so how do I make it work again? 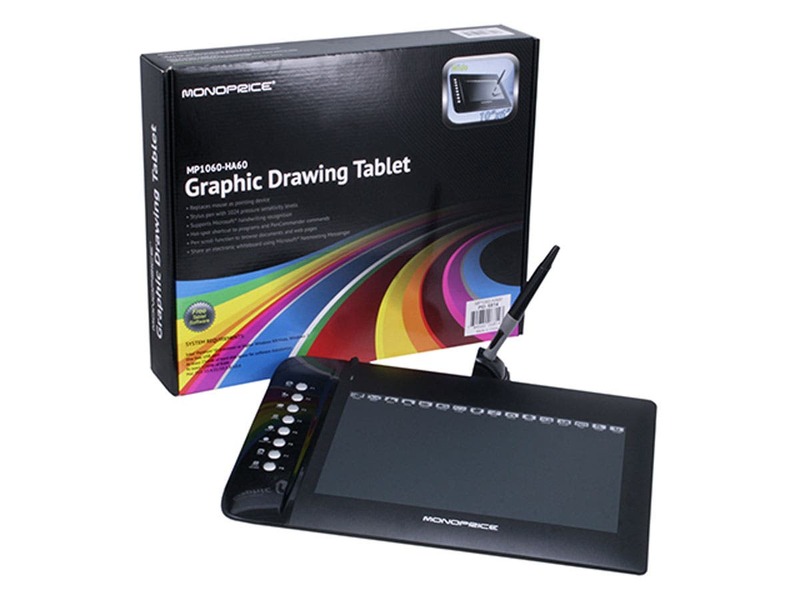 how do i connect my graphic drawing tablet to my Macbook? Pressure sensitivity stops working at random times. I've tried Medibang, FireAlpaca, and Photoshop but nothing works. Sometimes it works, sometimes it doesn't. At the moment it is not working, I searched everything. A lot of others have this problem but NOBODY has gotten an answer. It's difficult because I do commissions that I have a time limit for and It's hard for me to draw well without pressure sensitivity. I have had this tablet for maybe a year now (I know I got it as a Christmas gift.) and I have had this problem since I first got it. Does anyone know a fix for this? I don't want to buy another because this tablet still works... Sometimes. So I lost the disc recently and downloaded a copy of the disc from one of the other questions, but I can't reinstall the driver when I try it says I need the disk. Is there anything I can do to fix this or will I have to get a new tablet? Where can I download latest driver for this for Windows 10? 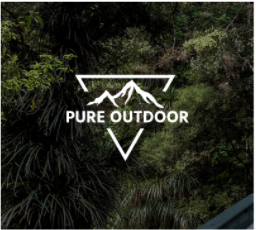 Overall I have been satisfied with this product. However, Monoprice needs to provide access to Mac drivers. The UC-Logic website linked in other reviews no longer exists. Therefore, no driver download availability. Please share Mac drivers. Bought this for my 8 year old as a Christmas gift. He is interested in graphic design and creating his own t-shirts. We've been using it on a Mac with very simple drawing software. After tweaking some settings (way too sensitive out of the box), he seems to enjoy it and his interest is growing. This tablet is a good buy for the price. More features than I expected ! I received the pad in one day, wow, and it is fantastic. It works with so many programs, use the windows 10 drivers though from windows instead of monoprice. I also bought a 3D printer and am so thrilled with the quality and fun things to make. 3rd: goto "C:\WINDOWS\SysWoW64\WTClient.exe" " and right click on WTClient.exe, select "properties", then click "compatibility" tab. Check the "run this program as administrator" box. 4th: restart system and test pressure sensitivity in preferred program. Tested, pressure sensitivity works in all 32bit programs (Photoshop, Sketchpad, etc.). PROS: Cost effective. Well made. CONS: Takes a few tweaks to get it working in Windows 8 or 10. I used to have this tablet a year ago, and aside from the odd glitch here and there, it worked wonderfully. However, as time went on something happened to the wires and the tablet stopped working, so I returned it with a warranty I had on it. Through a mix of being hard on money and overall lack of time, it took me awhile to buy a new one... but alas, here I am with my new tablet, ready to draw again! However, now my Mac is running on El Capitan OS, and I think this is causing the tablet to act very screwy... the cursor starts to dance around the screen just by holding the pen over the tablet, and it will sometimes start sporadically clicking things on its own. My drawings quickly became cluttered with random dots when I was just trying to draw a straight line. Then on top of that, both the shortcut buttons and hotkeys would straight out refuse to work at times until I clicked the pen on the tablet, and due to the aformentioned dancing cursor, that tends to lead to many Undos that unnecessarily needed to be made. What's sad is during the times when the cursor wasn't acting up, everything seemed to be running so well... the pressure was good, the lines were fluid, and the shortcuts worked exactly as needed. But as soon as it started to go wonky, I just had to wait it out. I've rebooted the computer, re-installed the software, and so on, but this keeps happening. As much as I would love to be happy with this tablet, sadly the current state it's in just isn't functional. Hope to get a response from an admin here to get an idea of what's happening. I feel like this is due to the OS not being compatible, as others have been making very similar claims. PROS: Nice, big open space on the tablet that allow for some good brush strokes. 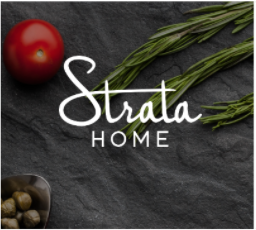 So many shortcuts and hotkeys that are completely customizable! While the buttons are a tad loud, they make the process of switching from brush to eraser incredibly fluid and natural. It doesn't have the greatest pressure sensitivity, but for what it does have it works relatively well. CONS: The cord can be a bit pesky when trying to store for travel. It will sometimes decide not to work, requiring you to unplug and re-plug in the tablet, this is simply an inconvenience but still something I felt was too wonky to not mention. I feel there's a bit too much empty space around the tablet, it makes the whole unit a bit larger than it needs to be, however this could just be a nitpick. I'm an art hobbyist and have very little experience with digital art. That being said, I like this tablet a lot. It's got quite a large drawing space, plays well with Photoshop and Paint Tool Sai, and is easy to configure once you get past the mess of driver conflicts. 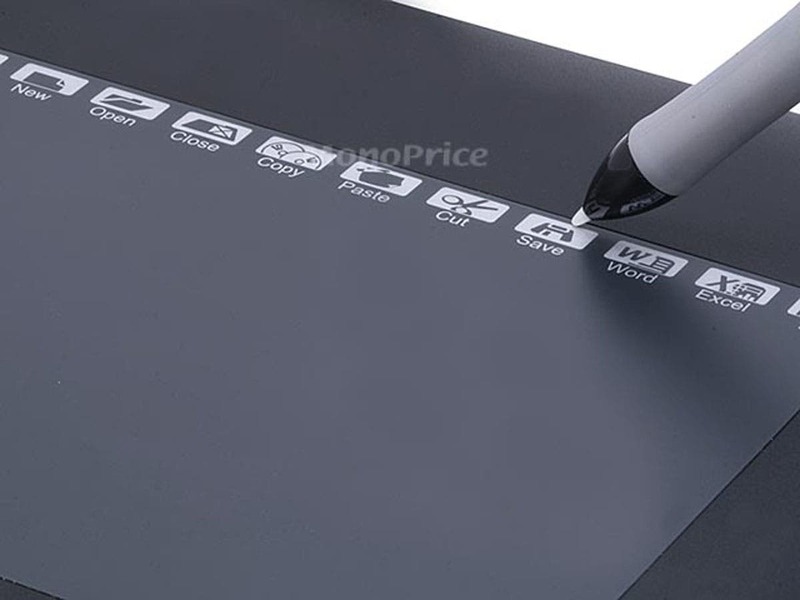 The included materials tell you to plug the tablet in BEFORE inserting the driver installation disc. If you do this, windows will assign its default drivers to the tablet, and no matter how much you install and uninstall, it will be broken until you system restore to a point before you plugged your tablet in and install the driver BEFORE plugging the tablet in. But once I got all the bugs smoothed out, it works perfectly. My only issue is that if I pull the pen more than half an inch away from the tablet while I'm drawing, I'll end up with a huge dot - sometimes several - on my drawing, I guess it interprets the loss of signal from the pen as a mouse click. I wanted to buy a graphics tablet for just two reasons. The first reason was fulfilled by this tablet, which I expected to. The thing I wanted most was for it to work, and it's very smooth! Just like all graphics tablets, its better than a mouse. The 2nd thing I wanted was to draw lines as thick as I want just by pressing down on the pad. One of my drawing applications on my computer was compatible with the driver and device. I was very happy with the fact that I could paint with variable line thickness. Sadly it doesn't work for any other applications, at all. The driver the tablet came with worked, but was incompatible with most of my drawing softwares. I tried using different drivers, and changing settings in my applications, but pressure sensitivity just seems to be supported by one software application. CONS: 1. Only compatible with a select few applications. 3. Very hard to find solutions to hardware or software problems, VERY hard. I am giving this a one, but I really can't comment on the actual tablet since the pen hasn't worked. I installed the included battery and the pen became hot, pulled the battery, it was hot, pen doesn't function. Which isn't why this review is a 1, sometimes things don't work, it's a cheap tablet, didn't really expect perfection. PROS: Can't say. Led on table did light. CONS: Cannot comment on operation of tablet or included software. Latest update to the drivers was 2011. Pen became a fire hazard.